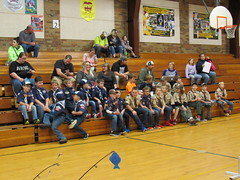 On Monday, October 8th, Learn 2 Fish With Us traveled to Pulaski, Wisconsin, where Captain Greg presented his Fishing Basics seminar to the Cub Scouts. 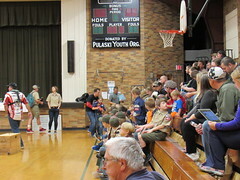 Besides Cub Scouts, sibling also attended which brought the youth count for this event to just over ninety. That is an awesome turnout!! 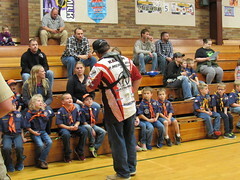 During the Fishing Basics seminar Captain Greg covered safety while fishing, parts of fish, how to us a spin cast and spinning fishing combo, how to cast, how to tie a Clinch and Palomar knot, different fishing presentations, live and artificial bait, fish identification and the Aquatic Invasive Species message of ‘Clean Drain Dry’ . We also reviewed catch and release and when fishing try to leave the area you are fishing cleaner than when you arrived. 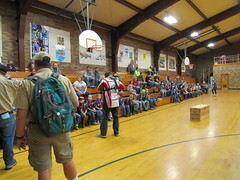 The youth were so excited when they learned that would get a educational book, Shakespeare’s, My Fishing Journal along with a fishing related prize. 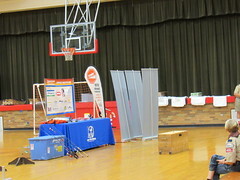 The prizes consisted of spin cast and spinning fishing combos, NPAA Future Pro shirts and Plano tackle boxes with tackle.